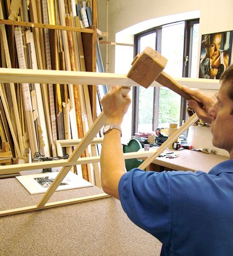 Founded in 1974, Cleeve Picture Framing has, over the years, established a reputation for skill, care and attentive personal service. Situated in Southam, just outside Bishops Cleeve, 2 miles from Cheltenham, in Gloucestershire, Cleeve Picture Framing has grown to be a force not only in the area, but nationally and internationally. Our clients have come from all over the world and include artists, dealers, museums, hotels and offices, as well as individual customers looking to enhance their pictures, family photos or make a feature by framing greeting cards or even rugby and football shirts. Interior designers are regular customers and may simply ask for a ‘Tudor look’ or something that fits in with Art Deco. Original art and themed framing can be undertaken to suit individual requirements. We pride ourselves on having regular customers, our craftsmanship and quality and are able to advise on all types of framing – no job is too big or small and framing can be undertaken to suit individual requirements. Feel free to browse this site or contact us if you have a query – we are always happy to help and advise. In our specialist workshops, located in a restored hay barn, the small team of skilled craftsmen handle commissions that vary from the family photograph to fine restoration. Backed by in excess of 500 patterns of moulding and mount boards we can satisfy a range of framing needs and budgets from the minimal to museum quality standard. We apply our exceptional craftsmanship and care to all commissions. We offer a hand finishing service on many of our natural wood mouldings as well as hand made modern and traditional swept frames. We can provide conservation grade framing and mounting for the preservation of artwork, including ultraviolet protective glass.